The Jackson Area Chamber of Commerce is looking forward to this year’s Farm & Home Show, which is scheduled for Saturday, March 19 from 9:00 a.m. to 3:00 p.m. The show will be held at the JCC High School, in the auxiliary gym and the commons area. This is an excellent opportunity to showcase your business products and services to a large number of potential customers. Now is the time to introduce those new items! 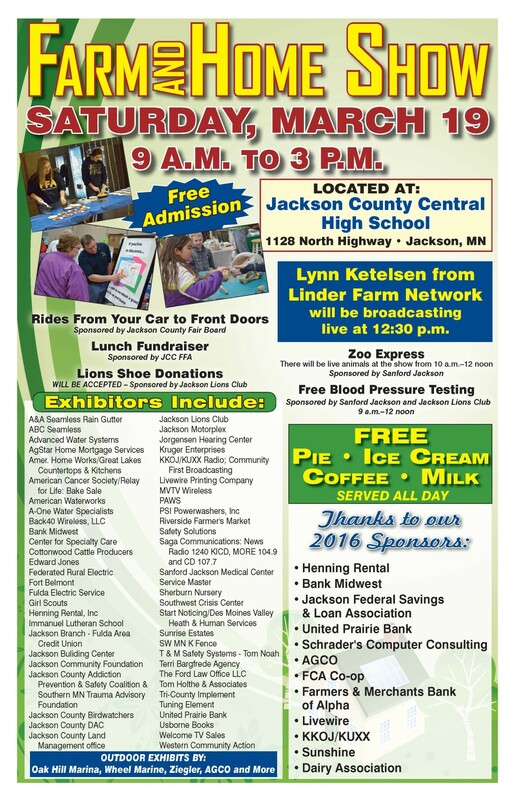 We plan to have free pie, ice cream, milk and coffee available all day courtesy of our Farm and Home Show sponsors. The JCC FFA Chapter will be serving lunch on-site, as one of their major fundraisers. Last year over 65 vendors were at the show and well over 800 people attended. Booth fee is $175 for this event. Registration is on a first-come, first-serve basis. You can either mail us your payment and registration form or you can email your registration form and then we can take your payment by phone. Simply return the registration form along with your payment by NOON February 23rd to confirm your booth space. We want to include all vendor names in promotion and advertising, so early registration helps. If you have any further questions, feel free to contact me at the Chamber office. We are here to assist you and look forward to another great event! The Jackson Area Chamber of Commerce and Farm & Home Show Committee! Are you a non-profit business who would be interested in participating in the Farm and Home Show? If so, you may be eligible for a Scholarship, which gives reduced booth rates. Click on the PDF below for the Application form and additional information! If your business is interested in being a show sponsor the 2015 Farm & Home Show, please see the informational letter and registration forms below.